Celtic polytheism, commonly known as Celtic paganism, comprises the religious beliefs and practices adhered to by the Iron Age peoples of Western Europe now known as the Celts, roughly between 500 BCE and 500 CE, spanning the La Tène period and the Roman era, and in the case of the Insular Celts the British and Irish Iron Age. 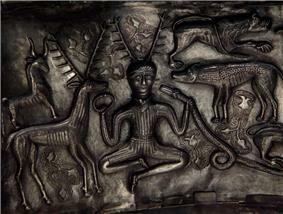 Celtic polytheism was one of a larger group of Iron Age polytheistic religions of the Indo-European family. It comprised a large degree of variation both geographically and chronologically, although "behind this variety, broad structural similarities can be detected" allowing there to be "a basic religious homogeneity" amongst the Celtic peoples. The Celtic pantheon consists of numerous recorded theonyms, both from Greco-Roman ethnography and from epigraphy. Among the most prominent ones are Teutatis, Taranis and Lugus. Figures from medieval Irish mythology have also been adduced by comparative mythology, interpreted as euhemerized versions of pre-Christian Insular deities. The most salient feature of Celtic religion as reflected in Roman historiography is their extensive practice of human sacrifice. According to Greek and Roman accounts, in Gaul, Britain and Ireland, there was a priestly caste of "magico-religious specialists" known as the druids, although very little is definitely known about them. Following the Roman Empire's conquest of Gaul (58–51 BCE) and southern Britannia (43 CE), Celtic religious practices began to display elements of Romanisation, resulting in a syncretic Gallo-Roman culture with its own religious traditions with its own large set of deities, such as Cernunnos, Artio, Telesphorus, etc. In the later 5th and the 6th centuries, the Celtic region was Christianized and earlier religious traditions were supplanted. However, the polytheistic traditions left a legacy in many of the Celtic nations, influenced later mythology, and served as the basis for a new religious movement, Celtic Neopaganism, in the 20th century. 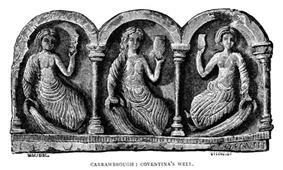 Three Celtic goddesses, as depicted at Coventina's well. Comparatively little is known about Celtic polytheism because the evidence for it is fragmentary, due largely to the fact that the Celts who practiced it wrote nothing down about their religion. Therefore all we have to study their religion from is the literature from the early Christian period, commentaries from classical Greek and Roman scholars, and archaeological evidence. The archaeologist Barry Cunliffe summarised the sources for Celtic religion as "fertile chaos", borrowing the term from the Irish scholar Proinsias MacCana. Cunliffe went on to note that "there is more, varied, evidence for Celtic religion than for any other example of Celtic life. The only problem is to assemble it in a systematic form which does not too greatly oversimplify the intricate texture of its detail." The archaeological evidence does not contain the bias inherent in the literary sources. Nonetheless, the interpretation of this evidence can sometimes be colored by the 21st century mindset. Various archaeological discoveries have aided understanding of the religion of the Celts. These include the coins of the Roman provinces in the Celtic lands of Gaul, Raetia, Noricum, and Britannia, and another is the sculptures, monuments, and inscriptions associated with the Celts. Most of the monuments, and their accompanying inscriptions, belong to the Roman period and reflect a considerable degree of syncretism between Celtic and Roman gods; even where figures and motifs appear to derive from pre-Roman tradition, they are difficult to interpret in the absence of a preserved literature on mythology. A notable example of this is the horned deity that was called Cernunnos; several depictions and inscriptions of him have been found, but very little is known about the myths that would have been associated with him or how he was worshiped. Literary evidence for Celtic religion also comes from sources written in Ireland and Wales during the Middle Ages, a period when traditional Celtic religious practices had become extinct and had long been replaced by Christianity. The evidence from Ireland has been recognised as better than that from Wales, being viewed as "both older and less contaminated from foreign material." These sources, which are in the form of epic poems and tales, were written several centuries after Christianity became the dominant religion in these regions, and were written down by Christian monks, "who may not merely have been hostile to the earlier paganism but actually ignorant of it." Instead of treating the characters as deities, they are allocated the roles of being historical heroes who sometimes have supernatural or superhuman powers, for instance, in the Irish sources the gods are claimed to be an ancient tribe of humans known as the Tuatha Dé Danann. Because they were written in a very Christian context, these sources must be scrutinised with even more rigor than the classical sources in assessing their validity as evidence for Celtic religion. While it is possible to single out specific texts which can be strongly argued to encapsulate genuine echoes or resonances of the pre-Christian past, opinion is divided as to whether these texts contain substantive material derived from oral tradition as preserved by bards or whether they were the creation of the medieval monastic tradition. Various Greek and Roman writers of the ancient world commented on the Celts and their beliefs. Barry Cunliffe stated that "the Greek and Roman texts provide a number of pertinent observations, but these are at best anecdotal, offered largely as a colourful background by writers whose prime intention was to communicate other messages." The Roman general (and later dictator) Julius Caesar, when leading the conquering armies of the Roman Republic against Celtic Gaul, made various descriptions of the inhabitants, though some of his claims, such as that the Druids practiced human sacrifice by burning people in wicker men, have come under scrutiny by modern scholars. However, the key problem with the use of these sources is that they were often biased against the Celts, whom the classical peoples viewed as "barbarians". In the case of the Romans who conquered several Celtic realms, they would have likely been biased in favour of making the Celts look uncivilised, thereby giving the "civilised" Romans more reason to conquer them. Celtic religion was polytheistic, believing in many deities, both gods and goddesses, some of which were venerated only in a small, local area, but others whose worship had a wider geographical distribution. The names of over two hundred of these deities have survived to us today, although it is possible that some of these names were different titles or epithets used for the same deity. Some Celtic theonyms can be established as Pan-Celtic (descending from the Common Celtic period) by comparing Continental with Insular Celtic evidence. An example of this is Gaulish Lugus, whose name is cognate with Irish Lugh and Welsh Lleu. Another example is Gaulish Brigantia, cognate with Irish Brigid. This latter theonym can even be reconstructed as a Proto-Indo-European epithet of the dawn goddess, as *bhr̥g'hntī "the one on high". Some of the Greek and Roman accounts mention various deities worshipped in Gaul, for instance Lucan noted the names of Teutates, Taranis and Esus, although Julius Caesar instead conflated the Celtic Gaulish deities with those of Roman religion, and did not mention their native Gaulish names. He declared that the most widely venerated god in Gaul was Mercury, the Roman god of trade, but that they also worshipped Apollo, Minerva, Mars and Jupiter. According to Classical era sources, the Celts worshiped the forces of nature and did not envisage deities in anthropomorphic terms, as other "pagan" peoples such as the Greeks, Romans, and Egyptians did. This appeared to change as the classical peoples grew in influence over the Celtic cultures, as the Celts did begin to give their deities human forms, and they moved from a more animistic-based faith to a more Romanised polytheistic view. Several of these deities, including Lugus and Matrones, were triple deities. In the Irish and to a lesser extent Welsh vernacular sources from the Middle Ages, various human mythological figures were featured who have been thought of by many scholars as being based upon earlier gods. The historian Ronald Hutton however cautioned against automatically equating all Irish and Welsh mythological figures as former deities, noting that whilst some characters "who appear to be human, such as Medb or St. Brighid, probably were indeed once regarded as divine... the warriors who are the main protagonists of the stories have the same status as those in the Greek myths, standing between the human and divine orders. To regard characters such as Cú Chulainn, Fergus Mac Roich or Conall Cernach as former gods turned into humans by a later storyteller is to misunderstand their literary and religious function... Cú Chulainn is no more a former god than Superman is." Examining these Irish myths, Barry Cunliffe stated that he believed they displayed "a dualism between the male tribal god and the female deity of the land" whilst Anne Ross felt that they displayed that the gods were "on the whole intellectual, deeply versed in the native learning, poets and prophets, story-tellers and craftsmen, magicians, healers, warriors... in short, equipped with every quality admired and desired by the Celtic peoples themselves." Insular Celts swore their oaths by their tribal gods, and the land, sea and sky; as in, "I swear by the gods by whom my people swear" and "If I break my oath, may the land open to swallow me, the sea rise to drown me, and the sky fall upon me." Some scholars, such as Prudence Jones and Nigel Pennick, have speculated that the Celts venerated certain trees and others, such as Miranda Aldhouse-Green, that the Celts were animists, believing that all aspects of the natural world contained spirits, and that communication was possible with these spirits. Places such as rocks, streams, mountains, and trees may all have had shrines or offerings devoted to a deity residing there. These would have been local deities, known and worshiped by inhabitants living near to the shrine itself, and not pan-Celtic like some of the polytheistic gods. The importance of trees in Celtic religion may be shown by the fact that the very name of the Eburonian tribe contains a reference to the yew tree, and that names like Mac Cuilinn (son of holly) and Mac Ibar (son of yew) appear in Irish myths. In Ireland, wisdom was symbolised by the salmon who feed on the hazelnuts from the trees that surround the well of wisdom (Tobar Segais). A reconstructed Celtic burial mound located near Hochdorf an der Enz in Germany. Such burials were reserved for the influential and wealthy in Celtic society. Celtic burial practices, which included burying food, weapons, and ornaments with the dead, suggest a belief in life after death. The druids, the Celtic learned classes which included members of the clergy, were said by Caesar to have believed in reincarnation and transmigration of the soul along with astronomy and the nature and power of the gods. A common factor in later mythologies from Christianised Celtic nations was the otherworld. This was the realm of the fairy folk and other supernatural beings, who would entice humans into their realm. Sometimes this otherworld was claimed to exist underground, whilst at other times it was said to lie far to the west. Several scholars have suggested that the otherworld was the Celtic afterlife, though there is no direct evidence to prove this. Evidence suggests that amongst the Celts, "offerings to the gods were made throughout the landscape – both the natural and the domestic." At times they worshipped in constructed temples and shrines, evidence for which have been unearthed across the Celtic world by archaeologists, although according to Greco-Roman accounts, they also worshipped in areas of the natural world that were held to be sacred, namely in groves of trees. Across Celtic Europe, many of the constructed temples, which were square in shape and constructed out of wood, were found in rectangular ditched enclosures known as viereckschanzen, where in cases such as Holzhausen in Bavaria votive offerings were also buried in deep shafts. However, in the British Isles, temples were more commonly circular in design. According to Barry Cunliffe, "the monumentality of the Irish religious sites sets them apart from their British and continental European counterparts" with the most notable example being the Hill of Tara. However, according to Greco-Roman accounts of the druids and other Celts, worship was held in groves, with Tacitus describing how his men cut down "groves sacred to savage rites." By their very nature, such groves would not survive in the archaeological record, and so we have no direct evidence for them today. Alongside groves, certain springs were also viewed as sacred and used as places of worship in the Celtic world. Notable Gaulish examples include the sanctuary of Sequana at the source of the Seine in Burgundy and Chamalieres near to Clermont-Ferrand. At both of these sites, a large array of votive offerings have been uncovered, most of which are wooden carvings, although some of which are embossed pieces of metal. In many cases, when the Roman Empire took control of Celtic lands, earlier Iron Age sacred sites were reused, with Roman temples being built on the same sites. Examples include Uley in Gloucestershire, Worth in Kent, Hayling Island in Hampshire, Vendeuil-Caply in Oise, Saint-Germain-le-Rocheux in Chatillon-sur-Seine and Schleidweiler in Trier. The Celts made votive offerings to their deities, which were buried in the earth or thrown into rivers or bogs. According to Barry Cunliffe, in most cases, deposits were placed in the same places on numerous occasions, indicating continual usage "over a period of time, perhaps on a seasonal basis or when a particular event, past or pending, demanded a propitiatory response." In particular, there was a trend to offer items associated with warfare in watery areas, evidence for which is found not only in the Celtic regions, but also in Late Bronze Age (and therefore pre-Celtic) societies and those outside of the Celtic area, namely Denmark. One of the most notable examples is the river Thames in southern England, where a number of items had been deposited, only to be discovered by archaeologists millennia later. Some of these, like the Battersea Shield, Wandsworth Shield and the Waterloo Helmet, would have been prestige goods that would have been labour-intensive to make and thereby probably expensive. Another example is at Llyn Cerrig Bach in Anglesey, Wales, where offerings, primarily those related to battle, were thrown into the lake from a rocky outcrop in the late first century BCE or early first century CE. At times, jewellery and other high prestige items that were not related to warfare were also deposited in a ritual context. At Niederzier in the Rhineland for example, a post that excavators believed had religious significance had a bowl buried next to it in which was contained forty-five coins, two torcs and an armlet, all of which made out of gold, and similar deposits have been uncovered elsewhere in Celtic Europe. 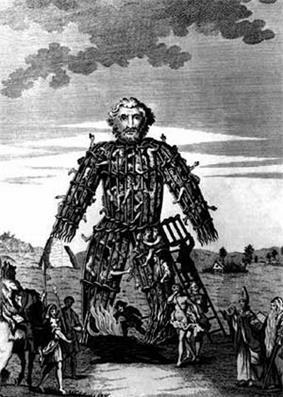 An 18th century illustration of a wicker man, a form of human sacrifice that Caesar alleged the Druids, or Celtic priesthood, performed, though no archaeological evidence has been uncovered to support this. Greco-Roman writers stated that the Celts practiced human sacrifice in Gaul: Cicero, Julius Caesar, Suetonius, and Lucan all refer to it, and Pliny the Elder says that it occurred in Britain, too. It was forbidden under Tiberius and Claudius. However, there is also the possibility that these claims may have been false, and used as a sort of propaganda to justify the Roman conquest of these territories. There are only very few recorded archaeological discoveries which preserve evidence of human sacrifice and thus most contemporary historians tend to regard human sacrifice as rare within Celtic cultures. However, there is also archaeological evidence from western Europe that has been widely used to back up the idea that human sacrifice was performed by the Iron Age Celts. Mass graves found in a ritual context dating from this period have been unearthed in Gaul, at both Gournay-sur-Aronde and Ribemont-sur-Ancre in what was the region of the Belgae chiefdom. The excavator of these sites, Jean-Louis Brunaux, interpreted them as areas of human sacrifice in devotion to a war god, although this view was criticised by another archaeologist, Martin Brown, who believed that the corpses might be those of honoured warriors buried in the sanctuary rather than sacrifices. At a bog in Lindow, Cheshire, England was discovered a body, designated the "Lindow Man", which may also have been the victim of a sacrificial ritual, but it is just as likely that he was an executed criminal or a victim of violent crime. The body is now on display at the British Museum, London. In Ireland, similar discoveries in 2003 of two murdered individuals preserved in separate bogs, each subsequently dated to around 100 BCE, lends some credence to the ritual murder theory. The iconography of the human head is believed by many archaeologists and historians to have played a significant part in Celtic religion. The Greek historian Diodorus Siculus, writing in the 1st century BCE, described how Celtic warriors "cut off the heads of enemies slain in battle and attach them to the necks of their horses." Strabo meanwhile commented in the same century that until the Roman authorities put a stop to it, amongst the Celts, "the heads of enemies held in high repute they used to embalm in cedar oil and exhibit to strangers." Archaeological evidence indicating that the Celts did indeed behead humans and then display their heads, possibly for religious purposes, has been unearthed at a number of excavations; one notable example of this was found at the Gaulish site of Entremont near to Aix-en-Provence, where a fragment of a pillar carved with images of skulls was found, within which were niches where actual human skulls were kept, nailed into position, fifteen examples of which were found. The archaeologist Barry Cunliffe believed that the Celts held "reverence for the power of the head" and that "to own and display a distinguished head was to retain and control the power of the dead person" whilst the archaeologist Anne Ross asserted that "the Celts venerated the head as a symbol of divinity and the powers of the otherworld, and regarded it as the most important bodily member, the very seat of the soul." The archaeologist Miranda Green meanwhile stated that "I refute any suggestion that the head itself was worshipped but it was clearly venerated as the most significant element in a human or divine image representing the whole." The historian Ronald Hutton however criticised the idea of the "cult of the human head", believing that both the literary and archaeological evidence did not warrant this conclusion, noting that "the frequency with which human heads appears upon Celtic metalwork proves nothing more than they were a favourite decorative motif, among several, and one just as popular among non-Celtic peoples." According to a number of Greco-Roman writers such as Julius Caesar, Cicero, Tacitus and Pliny the Elder, Gaulish and British society held a group of magico-religious specialists known as the druids in high esteem. Their roles and responsibilities differed somewhat between the different accounts, but Caesar's, which was the "fullest" and "earliest original text" to describe the druids, described them as being concerned with "divine worship, the due performance of sacrifices, private or public, and the interpretation of ritual questions." He also claimed that they were responsible for officiating at human sacrifices, such as the wicker man burnings. Nonetheless, a number of historians have criticised these such accounts, believing them to be biased or inaccurate. Vernacular Irish sources also referred to the druids, portraying them not only as priests but as sorcerers who had supernatural powers which they used for cursing and divination and who opposed the coming of Christianity. Various historians and archaeologists have interpreted the druids in different ways; Peter Berresford Ellis for instance believed them to be the equivalents of the Indian Brahmin caste, whilst Anne Ross believed that they were essentially tribal priests, having more in common with the shamans of tribal societies than with the classical philosophers. Ronald Hutton meanwhile held a particularly sceptical attitude to many claims made about them, and he supported the view that the evidence available was of such a suspicious nature that "we can know virtually nothing of certainty about the ancient Druids, so that – although they certainly existed – they function more or less as legendary figures." Two druids, from an 1845 publication, based on a bas-relief found at Autun, France. In Ireland the fili were visionary poets, associated with lorekeeping, versecraft, and the memorisation of vast numbers of poems. They were also magicians, as Irish magic is intrinsically connected to poetry, and the satire of a gifted poet was a serious curse upon the one being satirised. To run afoul of a poet was a dangerous thing indeed to a people who valued reputation and honor more than life itself. In Ireland a "bard" was considered a lesser grade of poet than a fili – more of a minstrel and rote reciter than an inspired artist with magical powers. However, in Wales bardd was the word for their visionary poets, and used in the same manner fili was in Ireland and Scotland. The Celtic poets, of whatever grade, were composers of eulogy and satire, and a chief duty was that of composing and reciting verses on heroes and their deeds, and memorising the genealogies of their patrons. It was essential to their livelihood that they increase the fame of their patrons, via tales, poems and songs. As early as the 1st century CE, the Latin author Lucan referred to "bards" as the national poets or minstrels of Gaul and Britain. In Gaul the institution gradually disappeared, whereas in Ireland and Wales it survived. The Irish bard through chanting preserved a tradition of poetic eulogy. In Wales, where the word bardd has always been used for poet, the bardic order was codified into distinct grades in the 10th century. Despite a decline of the order toward the end of the European Middle Ages, the Welsh tradition has persisted and is celebrated in the annual eisteddfod, a national assembly of poets and musicians. The oldest attested Celtic calendar is the Coligny calendar, dated to the 2nd century and as such firmly within the Gallo-Roman period. Some feast days of the medieval Irish calendar have sometimes been speculated to descend from prehistoric festivals, especially by comparison to terms found in the Coligny calendar. This concerns Beltane in particular, which is attributed ancient origin by medieval Irish writers. The festivals of Samhain and Imbolc are not associated with "paganism" or druidry in Irish legend, but there have nevertheless been suggestions of a prehistoric background since the 19th century, in the case of Samhain by John Rhys and James Frazer who assumed that this festival marked the "Celtic new year". The Celtic peoples of Gaul and Hispania under Roman rule fused Roman religious forms and modes of worship indigenous traditions. In some cases, Gaulish deity names were used as epithets for Roman deities, as with Lenus Mars or Jupiter Poeninus. In other cases, Roman gods were given Gaulish female partners – for example, Mercury was paired with Rosmerta and Sirona was partnered with Apollo. In at least one case – that of the equine goddess Epona – a native Celtic goddess was also adopted by Romans. This process of identifying Celtic deities with their Roman counterparts was known as Interpretatio romana. Eastern mystery religions penetrated Gaul early on. These included the cults of Orpheus, Mithras, Cybele, and Isis. The imperial cult, centred primarily on the numen of Augustus, came to play a prominent role in public religion in Gaul, most dramatically at the pan-Gaulish ceremony venerating Rome and Augustus at the Condate Altar near Lugdunum on 1 August. Generally Roman worship practices such as offerings of incense and animal sacrifice, dedicatory inscriptions, and naturalistic statuary depicting deities in anthropomorphic form were combined with specific Gaulish practices such as circumambulation around a temple. This gave rise to a characteristic Gallo-Roman fanum, identifiable in archaeology from its concentric shape. The conversion to Christianity inevitably had a profound effect on this socio-religious system from the 5th century onward, though its character can only be extrapolated from documents of considerably later date. By the early 7th century the church had succeeded in relegating Irish druids to ignominious irrelevancy, while the filidh, masters of traditional learning, operated in easy harmony with their clerical counterparts, contriving at the same time to retain a considerable part of their pre-Christian tradition, social status, and privilege. But virtually all the vast corpus of early vernacular literature that has survived was written down in monastic scriptoria, and it is part of the task of modern scholarship to identify the relative roles of traditional continuity and ecclesiastical innovation as reflected in the written texts. Cormac's Glossary (c. 900 CE) recounts that St. Patrick banished those mantic rites of the filidh that involved offerings to "demons", and that the church took particular pains to stamp out animal sacrifice and other rituals repugnant to Christian teaching. What survived of ancient ritual practice tended to be related to filidhecht, the traditional repertoire of the filidh, or to the central institution of sacral kingship. A good example is the pervasive and persistent concept of the hierogamy (sacred marriage) of the king with the goddess of sovereignty: the sexual union, or banais ríghi ("wedding of kingship"), which constituted the core of the royal inauguration, seems to have been purged from the ritual at an early date through ecclesiastical influence, but it remains at least implicit, and often quite explicit, for many centuries in the literary tradition. Nagy has noted the Gaelic oral tradition has been remarkably conservative. The fact that we have tales in existence which were still being told in the 19th century in almost exactly the same form as they exist in ancient manuscripts leads to the strong probability that much of what the monks recorded was considerably older. Though the Christian interpolations in some of these tales are very obvious, many of them read like afterthoughts or footnotes to the main body of the tales, which most likely preserve traditions far older than the manuscripts themselves. Mythology based on (though, not identical to) the pre-Christian traditions was still common place knowledge in Celtic-speaking cultures in the 19th century. In the Celtic Revival, such survivals were collected and edited, thus becoming a literary tradition which in turn influenced modern mainstream "Celticity". Various rituals involving acts of pilgrimage to sites such as hills and sacred wells which are believed to have curative or otherwise beneficial properties are still performed. Based on evidence from the European continent, various figures which are still known in folklore in the Celtic countries up to today, or who take part in post-Christian mythology, are known to have also been worshiped in those areas that did not have records before Christianity. In Twilight of the Celtic Gods (1996), Clarke and Roberts describe a number of particularly conservative folkloristic traditions in remote rural areas of Great Britain, including the Peak District and Yorkshire Dales, including claims of surviving pre-Christian Celtic traditions of veneration of stones, trees and bodies of water. Various Neopagan groups claim association with Celtic polytheism. These groups range from the Reconstructionists, who work to practice ancient Celtic religion with as much accuracy as possible; to new age, eclectic groups who take some of their inspiration from Celtic mythology and iconography, the most notable of which is Neo-druidry. ^ Ross, Anne (1974). Pagan Celtic Britain: Studies in Iconography and Tradition. London: Sphere Books Ltd.
^ Hutton, Ronald (1991). The Pagan Religions of the Ancient British Isles: Their Nature and Legacy. Oxford, UK and Cambridge, USA: Blackwell. ^ Jones, Prudence and Pennick, Nigel (1995). A History of Pagan Europe. Routledge. ^ a b Cunliffe, Barry (1997). The Ancient Celts. Oxford and New York: Oxford University Press. Page 184. ^ Ross, Anne (1986). The Pagan Celts. London: B.T. Batsford. Page 103. ^ Hutton, Ronald (2009). Blood and Mistletoe: The History of the Druids in Britain. Yale University Press. Page 17. ^ a b c d e Miranda J. Green. (2005) Exploring the world of the druids. London: Thames & Hudson. ISBN 0-500-28571-3. Page 24. ^ Emrys Evans (1992) Mythology Little Brown & Company. ISBN 0-316-84763-1. Page 170. ^ Emrys Evans (1992) Mythology Little Brown & Company. ISBN 0-316-84763-1. Pp. 170–171. ^ a b Cunliffe, Barry (1997). The Ancient Celts. Oxford and New York: Oxford University Press. Page 183. ^ Hutton, Ronald (1991). The Pagan Religions of the Ancient British Isles: Their Nature and Legacy. Oxford, UK and Cambridge, USA: Blackwell. Page 147. ^ Hutton, Ronald (1991). The Pagan Religions of the Ancient British Isles: Their Nature and Legacy. Oxford, UK and Cambridge, USA: Blackwell. Page 148. ^ Dr Ray Dunning (1999) The Encyclopedia of World Mythology Parragon. ISBN 0-7525-8444-8. ^ Cunliffe, Barry (1997). The Ancient Celts. Oxford and New York: Oxford University Press. Page 187. ^ Caesar. Commentarii de Bello Gallico. Book 6. ^ Juliette Wood. ‘Introduction.’ In Squire, C. (2000). The mythology of the British Islands: an introduction to Celtic myth, legend, poetry and romance. London & Ware: UCL & Wordsworth Editions Ltd. ISBN 1-84022-500-9. Pp. 12–13. ^ Emrys Evans — Little, Brown & Company, Page 171. ^ Hutton, Ronald (1991). The Pagan Religions of the Ancient British Isles: Their Nature and Legacy. Oxford, UK and Cambridge, USA: Blackwell. Pp. 175–176. ^ Cunliffe, Barry (1997). The Ancient Celts. Oxford and New York: Oxford University Press. Page 185. ^ Ross, Anne (1986). The Pagan Celts. London: B.T. Batsford. Page 102. ^ Marie-Louise Sjoestedt, Gods and Heroes of the Celts, translated by Myles Dillon, Berkeley, CA, Turtle Island Foundation, 1982, p.17. ISBN 0-913666-52-1. ^ Jones, Prudence and Pennick, Nigel (1995). A History of Pagan Europe. Routledge. Page 81. ^ Miranda Green. (1992:196) Animals in Celtic Life and Myth. London: Routledge. ISBN 0-415-05030-8. ^ Barry Cunliffe, The Ancient Celts. Oxford, Oxford University Press, 1997, pp. 208–210. ISBN 0-19-815010-5. ^ Julius Caesar, Commentarii de Bello Gallico 5:14. ^ a b The Celts in The Encyclopedia of World Mythology, Dr Ray Dunning, page 91. ^ Cunliffe, Barry (1997). The Ancient Celts. Oxford and New York: Oxford University Press. Page 197. ^ Cunliffe, Barry (1997). The Ancient Celts. Oxford and New York: Oxford University Press. Page 200. ^ Cunliffe, Barry (1997). The Ancient Celts. Oxford and New York: Oxford University Press. Page 207. ^ Cunliffe, Barry (1997). The Ancient Celts. Oxford and New York: Oxford University Press. Page 198. ^ Cunliffe, Barry (1997). The Ancient Celts. Oxford and New York: Oxford University Press. Pp. 198-199. ^ Cunliffe, Barry (1997). The Ancient Celts. Oxford and New York: Oxford University Press. Page 204. ^ a b c Cunliffe, Barry (1997). The Ancient Celts. Oxford and New York: Oxford University Press. Page 194. ^ Cunliffe, Barry (1997). The Ancient Celts. Oxford and New York: Oxford University Press. Page 195. ^ Brunaux, Jean-Louis (2001). "Gallic Blood Rites" in Archaeology 54.2. ^ Brunaux, Jean-Louis (2002). "Le Santuaire gaulois de Gournay-sur-Aronde" in Bulletin 56 of the Archaeological and Historical Company of Boulounge-Conchy-Hainvillers. ^ Hutton, Ronald, The Druids (London: Hambledon Continuum, 2007), pp. 133–134. ^ Hutton, Ronald, The Druids (London: Hambledon Continuum, 2007, p. 132. ^ Diodorus Siculus. History. 5.29. ^ Cunliffe, Barry (1997). The Ancient Celts. Oxford and New York: Oxford University Press. Page 202. ^ Cunliffe, Barry (1997). The Ancient Celts. Oxford and New York: Oxford University Press. Page 210. ^ Ross, Anne (1974). Pagan Celtic Britain: Studies in Iconography and Tradition. London: Sphere Books Ltd. Pp. 161-162. ^ Green, Miranda. The Gods of the Celts. Page 32. ^ Hutton, Ronald (1991). The Pagan Religions of the Ancient British Isles: Their Nature and Legacy. Blackwell. Page 195. ^ a b Caesar, Julius. De bello gallico. VI.13–18. ^ Cicero. De divinatione. I.XVI.90. ^ Pliny. Historiae naturalis. XVI.249. ^ Hutton, Ronald (2009). Blood and Mistletoe: The History of the Druids in Britain. Yale University Press. Page 02. ^ Piggott, Stuart (1968). The Druids. London: Thames & Hudson. Page 111. ^ Hutton, Ronald (2009). Blood and Mistletoe: The History of the Druids in Britain. Yale University Press. Pp. 04-05. ^ Hutton, Ronald (2009). Blood and Mistletoe: The History of the Druids in Britain. Yale University Press. Pp. 32–33. ^ Ellis, Peter Berresford (1994). The Druids. London: Constable. passim. ^ Ross, Anne (1967). Pagan Celtic Britain. London: Routledge. Pp. 52–56. ^ Hutton, Ronald (2007). The Druids London: Hambledon Continuum. p. xi. ^ David Clarke and Andy Roberts, Twilight of the Celtic Gods: An Exploration of Britain's Hidden Pagan Traditions (1996), ISBN 978-0-7137-2522-3; review. Anwyl, Edward (1906), Celtic Religion in Pre-Christian Times. de Vries, Jan (1961) Keltische Religion, a comprehensive survey. Duval, Paul-Marie (1976) Les Dieux de la Gaule, new ed. updated and enlarged. Green, Miranda (1986, revised 2004) Gods of the Celts. Macbain, Alexander (1885), Celtic Mythology and Religion (Internet Archive online edition). Mac Cana, Proinsias (1970) Celtic Mythology, copious illustrations. MacCulloch, J. A. (1911) The Religion of the Ancient Celts (Project Gutenberg online edition; 2009 reprint: ISBN 978-1-60506-197-9). MacCulloch, J. A. (1948) The Celtic and Scandinavian Religions, Hutchinson's University Library (2005 reprint: Cosimo Classics, ISBN 978-1-59605-416-5). Maier, Bernhard (1997); originally published in German in 1994) Dictionary of Celtic religion and culture, Boydell & Brewer, ISBN 978-0-85115-660-6. Sjoestedt, Marie-Louise (1949, reissued 1982; originally published in French, 1940) Gods and Heroes of the Celts, comparisons between deities of the various Celtic cultures vs Classical models. Stercks, Claude (1986) Éléments de cosmogonie celtique, contains an interpretive essay on the goddess Epona and related deities. Vendryes, Joseph; Tonnelat, Ernest; Unbegaun, B.-O. (1948) Les Religions des Celtes, des Germains et des anciens Slaves.